This set of 12 kittys makes great party favors or a great little gift for any cat or ducky lover. Each duck measures approximately 2"H x 2"W x 2"L. These do not float upright. They do squeak. You'll receive 3 of each of the 4 designs pictured, for a total of 12. 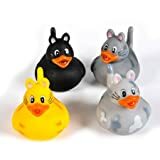 Each kitty rubber duck measures approximately 2"H x 2"W x 2"L.